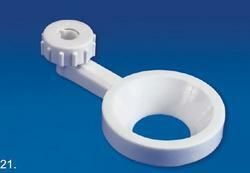 Made of polypropylene these corrosion free funnel holders can hold funnels with dia 3" to 6". The extra plate provided can be placed to hold funnels bearing dia 1" to 3". Two tapered wedges are provided to ensure firm grip on rods having dia 1/2"or3/8". firm grip on rods having dia ½ or 3/8. Made of Polypropylene these corrosion free Funnel Holders can hold funnels with dia 3″ to 6″. The extra plate provided can be placed to hold funnels bearing dia 1″ to 3″. Two tapered wedges are provided to ensure firm grip on Rods having dia 1/2″or3/8″. funnel holder with non corrosive clamp with 2 parts, inner ring for funnel from 1. ½ to 3" dia. And outer ring 3" to 6" dia.